Guests at TreeHouse Point often ask us about the designer behind the lovely seasonal decorations inside the Lodge. These simple, attractive designs subtly bringing each season into the central hub of TreeHouse Point. We spent an afternoon with interior designer and seasonal decorator extraordinaire, Rheanna Pless, as she transformed TreeHouse Point's summery decorations into autumn-inspired decor. Rheanna beautifully encapsulates the essence of TreeHouse Point in her designs by incorporating natural materials and objects found onsite. Today, we're sharing the stages of her seasonal design process. You might get inspired to recreate Rheanna's designs in your own home; her fall decorations would be a fun, economical, and family-friendly DIY project for Thanksgiving! We know kids would love scrounging for leaves and other materials to use in the decorations. Read on to see the transformation of seasonal design inside TreeHouse Point. You might get inspired to DIY! Rheanna's autumnal decorations seem to float above the large dining room table in the Lodge at TreeHouse Point. Guests come together at this table to dine on the B&B's scrumptious, homemade continental breakfast every morning. For a peak inside the TreeHouse Point kitchen, check out our Nectarine Jam post. Rheanna's summery designs before they are transformed into a celebration of fall. Rheanna always incorporates materials found at TreeHouse Point into her designs, including these elegant branches and small glass vessels. Her advice? Go hunting for treasures in your own home and backyard. Using materials found onsite is an easy way to bring a sense of place to your designs. For summer, Rheanna painted segments of the branches with bright colors. Guests at TreeHouse Point often return to the Lodge in the evenings, to sip cocoa and tea by the fireplace. Rheanna's summery centerpieces are full of bright, happy colors and geometric lines. Rheanna gathered leaves from TreeHouse Point's grounds to incorporate into her fall designs. By using flora found onsite, Rheanna ensures her designs reflect the natural environment of TreeHouse Point. Golden maple leaves at TreeHouse Point look prehistorically large. Their size is a happy symptom of the ultra-lush natural environment of the Pacific Northwest. To semi-preserve leaves for the interior decoration, Rheanna soaked them in a mixture of glycerin and water for a week, and then allowed time to dry afterward. Rheanna begins her designs without a concrete concept for the final product. By bringing a variety of festive materials and an open mind, she leaves plenty of room for playful improvisation while creating new decorations. In addition to the materials found at TreeHouse Point, Rheanna brought yarn, faux flowers, and gourds. These materials provide a multitude of texture and color for the designs. Rheanna chose a main color palette of burnt orange, creamy white, and gray-blue for fall. Rheanna decided to transform the skeleton of her summery decorations, rather than scrap the entire existing structure. Here, Rheanna begins to remove pieces from her summer designs. The branches are suspended from small hooks in the ceiling by nearly invisible strands of fishing line. Rheanna mixed good ol' Elmer's Glue with water to create a sticky solution for coating the yarn. She then dipped strands of yarn into the solution before wrapping them around the previously painted segments of each branch. Wrapping yarn around the branches instantly gives the design a cozy, autumnal feel. AFTER: THE COMPLETED FALL DESIGNS! Rheanna hung three levels of branches from the ceiling, and fastened leaves to each branch with fishing line. The completed designs are delicate, natural mobiles of softly falling leaves. Leaves appear to softly cascade down from the yarn-wrapped branches. Rheanna also created these autumnal centerpieces with real leaves, gourds, and faux flowers. Rheanna also added a similar design above the fireplace mantel. We are in love with Rheanna's fall decorations! They add festive flare to the inside of the Lodge, and beautifully reflect the natural environment of TreeHouse Point. To view more of Rheanna's gorgeous design work, check out her website at www.rheannapless.com and follow her on Instagram @rhecycled. You can see Rheanna's designs in person by booking a stay or registering for a tour at TreeHouse Point. 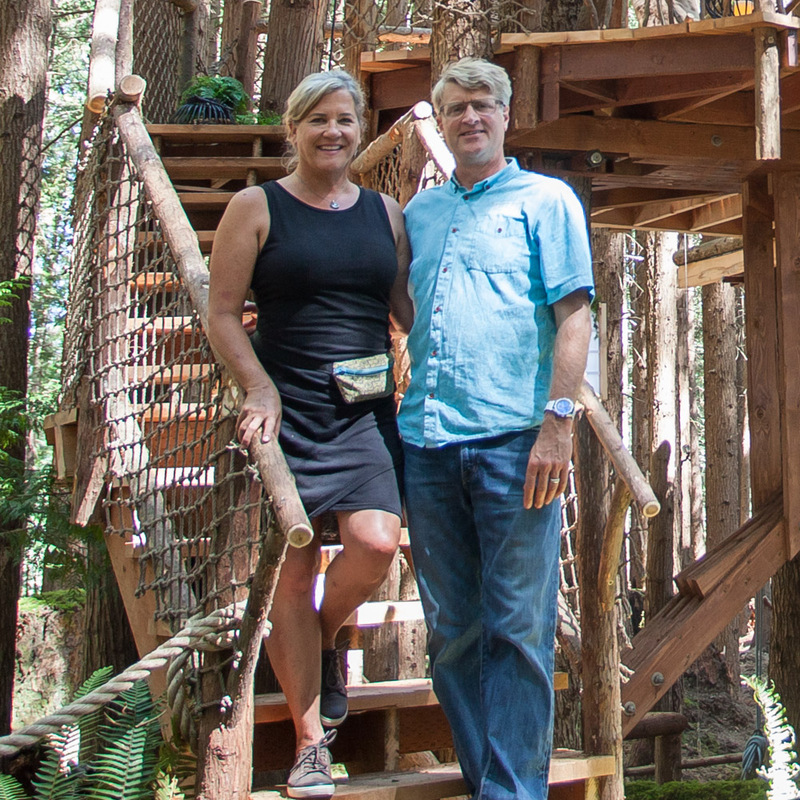 For more information, visit TreeHouse Point's website. Are you thinking of recreating Rheanna's designs in your home for Thanksgiving? If so, we'd love to see your work! Feel free to tag us on Instagram with #treehouseflare.